When it comes to multi-stream recycling receptacles, Securr has plenty of indoor and outdoor options from which you can choose. 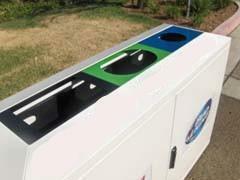 Here is a look at the many great indoor multi-stream recycling units available at Securr. You also have the option of placing vinyl labels to show what should be placed in each of the three receptacles stored by in the container. Another option is to add the decoreative ¼” hold covers. Your logo or message can also be placed on the outsid of the corrosion-resistant galvanealed steel container. Rigid plactic liners are also included, while the top inserts are available in different colors. This model is ideal for use in stadiums, arenas, sports complexes, concert halls, movie theaters, office complexes, transportation centers, school campuses, shopping malls and airports. When fully assembled, it measures 40 inches tall, 20 inches wide and 60 inches long while weighing just 213 pounds. 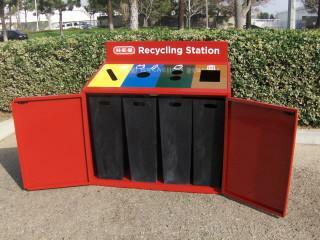 The 160 gallon rectangle indoor recycling receptacle allows for 5 different items to be recycled or thrown away. Available in all of the same colors as the previous model except for white, this R-series receptacle comes with five 32-gallon plastic rigid liners and interchangeable top panels that can be configured to meet your requirements. Measuring 26 inches wide, 51 inches high and 62 inches long and weight 390 pounds, the receptacle comes with two-point locking hatches. Magnetic latches are also available as an extra option. Similar to the previous model, the 128 gallon rectangle indoor recycling receptacle offers four 32-gallon plastic rigid liners instead of five. 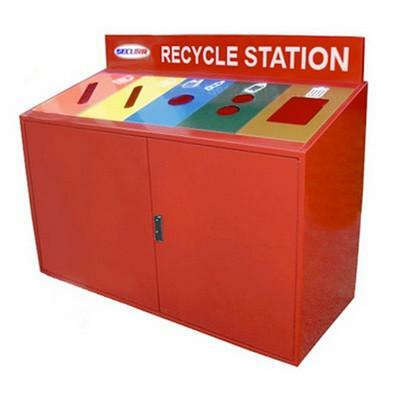 Made from corrosion-resistant recycled materials, this four-stream R-series recycling center weighs 320 pounds and measures 26 inches wide, 51 inches high and 51 inches long. 33 of these units fit in a full truckload. A smaller version of the previous receptacle, the 96 gallon rectangle indoor recycling receptacle is a three-stream model offering many years of trouble-free service. This R-Series model weighs 300 pounds and measures 26 inches wide, 51 inches high and 38 inches long. The last of the R-series of indoor recycling containers, the 64 gallon rectangle indoor recycling receptacle is a two-stream model offering two 32-gallon plastic rigid liners for collecting recyclable materials. As with all of the models in this series, the ADA-compliant model offers interchangeable top panels that can be configure to meet the unique requirements of your business or organizations. This model weighs 175 pounds and measures 26 inches wide, 51 inches high and 26 inches long. A number of outdoor multi-stream recycling receptacles are also available, including a 96-gallon three-output model and a 128-gallon four-output model. Both models are available in all of the same colors as the R-series of indoor multi-stream receptacles.